What is Organic Agriculture | Infonet Biovision Home. 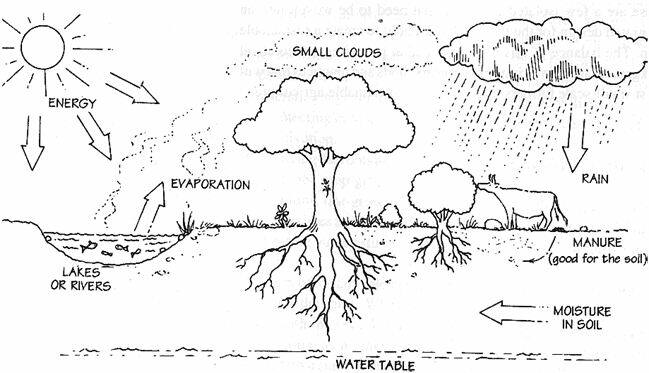 An illustration showing the Water cycle. (Vukasin et al. 1995). Organic agriculture is a holistic system approach based upon sustainable ecosystems, safe food, good nutrition, animal welfare and social justice. Many different expressions have come to be used to imply greater sustainability in some agricultural systems over prevailing ones (both pre-industrial and industrialized). These include biodynamic, community-based, eco-agriculture, ecological, environmentally sensitive, extensive, farm-fresh, free-range, low-input, organic, permaculture, sustainable and wise use. There is a continuing and intense debate about whether agricultural systems using some of these practices can qualify as sustainable. (iv) Make productive use of people's collective capacities to work together to solve common agricultural and natural resource problems, such as pests, animal husbandry and welfare, disease management, watershed, irrigation, forest and credit management. Sustainability in agricultural systems incorporates concepts of both resilience (the capacity of systems to resist shocks and stresses) and persistence (the capacity of systems to continue over long periods), and addresses many wider economic, social and environmental outcomes. Agricultural systems with high levels of social and human assets are more able to adapt to change and innovate in the face of uncertainty. This suggests that there are likely to be many pathways towards agricultural sustainability; no single system of technologies, inputs or ecological management is more likely to be widely applicable than another. Agricultural sustainability then implies the need to fit these factors to the specific circumstances of different local agricultural systems. If sustainable agricultural systems are those that aim to make the best use of environmental goods and services while not damaging the five assets - particularly natural, social and human capital, then an integrated organic farming system can be considered inherently sustainable. (ii) the management of ecological and biological processes. Use of external inputs, whether inorganic or organic, is reduced as far as possible. 'Organic agriculture' is a defined system of agricultural production that seeks to promote and enhance an ecosystem's health while minimizing adverse effects on natural resources. It is seen not just as a modification of existing conventional practices, but also as a restructuring of whole farm systems. The FAO/WHO Codex Alimentarius guidelines, recognized by UNCTAD in its Trade and Environment Revi ew 2006, defines organic agriculture as 'a holistic production management [whose] primary goal s to optimize the health and productivity of interdependent communities of soil, life, plants animals and people'. Similarly, the International Federation of Organic Agricultural Movements (IFOAM), which has over 750 member organizations in 108 countries, defines it as 'a whole system approach based upon sustainable ecosystems, safe food, good nutrition, animal welfare and social justice. Organic production therefore is more than a system of production that includes or excludes certain inputs. Certified organic agriculture is a subset of organic agriculture. The production of certified organic products has been objectively assessed as conforming with precise organic production standards, usually by a third party certification body. We define 'organic agriculture' to agriculture that meets organic production standards and 'certified organic' refers to agriculture that is assessed subject to organic inspection, certification and labeling. 'Near-organic' agriculture refers to sustainable traditional farming systems. 'Organic by default' refers to greater number of farmers (especially small-holders) that cannot afford costs of external input. Many traditional farming systems found in developing countries practice organic techniques without seeking or receiving the premium price given to organic food in some domestic markets. Traditional agriculture includes management practices that have evolved through centuries to create agricultural systems adapted to local environmental and cultural conditions. Owing to their nature, traditional systems do not use synthetic agricultural inputs but apply ecological approaches to enhance agricultural production. Many of these traditional systems may not fully meet the production standards for organic agriculture, but can be considered near-organic. Rather than clear divisions between the sustainable, traditional and organic agriculture farming categories described, there is often some overlap in practice. There has been a huge growth in both the international and domestic markets for organic produce worldwide, and there are profitable returns for certified organic products. In African countries where an established and widespread domestic market for organic produce is not present, the majority of certified organic production is for export. Whereas third-party certification is essential for export of organic produce to Europe and the United States, for local markets in Africa it is not always required. Organic certification for domestic markets offers a 'quality assurance' that gives the consumer the security of knowing that food has been produced according to strict organic production standards. In East Africa, along with other developing countries, low-cost, accessible solutions to guarantee the integrity of organic produce for local domestic markets are being developed, including direct sales based on trust, local certification bodies and participatory guarantee systems. (ii) farmers joining together to form groups and cooperatives, and thus reducing the costs to the individual. The rules of most certifying organizations (bodies) require a conversion period of at least one year, but sometimes two to three years. The reason is, sometimes several years must pass before residues of agrochemicals previously used finally disappear in the soil. During the conversion period, a farmer may have the disadvantage of not being allowed to use pesticides or chemical fertilizers. At the same, the farmer cannot yet sell the produce as organic. That could be a problem for the 'convertees' to organic production. Also after many years of using pesticides and chemical fertilizers, the farm may not have a good ecological balance. It may not yet have a healthy diversity of natural enemies of arthropod pests, beneficial soil micro-organisms, etc. For this reason, pests may cause problems, and it may be somewhat difficult to achieve a good level of balanced of bio-diversity. After a few years, however, both good pest management and soil fertility would be restored by a diverse healthy mixture of components of nature. To help farmers earn money during the 'difficult' transition period of conversion, some certifying organizations allow farmers to label and sell their products as "organic in conversion" products. Customers who understand the systems may be willing to pay a bit higher price for the "organic in conversion" products than those produced through conventional farming. Agriculture, by its inherent multi functionality, has the potential to both influence and address the factors that contribute to food insecurity. Organic agriculture relies on five capital assets for success (natural, social, human, physical and financial) and so contributes to and builds up stocks of these natural, social and economic resources over time 3 thus often reducing many of the factors that lead to food insecurity. In developing countries, evidence from research and from this study shows that agricultural yields in organic systems do not fall, and at least remain stable when converting from systems that use relatively low amounts of synthetic inputs (many of which were by-passed by the earlier 'green revolution') such as those frequently found in Africa. Over time, yields increase as capital assets in systems improve, thus outperforming those in traditional systems and matching those in more conventional, input-intensive systems. Food availability increased in all cases centred on food production where data were reported examined in this study. Others, such as Gibbon and Bolwig (2007), have also found that organic conversion in tropical Africa is associated with yield increases rather than with yield reductions. Organic farming increases access to food on several levels. First, increased quantity of food produced per farm leads to household food security which results in all members of the household having access to enough food. Second, the production and selling of food surpluses at local markets means that farmers benefit from higher incomes, which increases their purchasing power. Third, fresh organic produce becomes available to more people in the wider community. Finally, organic farming enables new and different groups in a community to get involved in agricultural production and trade where previously they were excluded for financial or cultural reasons. The vast majority of the case studies in this research showed improvements to the natural capital base - their local natural environment - with 93 per cent of the case studies reporting benefits to soil fertility, water supply, flood control and biodiversity. Organic farming leads to many improvements to the natural environment, including increased water retention in soils, improvements in the water table (with more drinking water in the dry season), reduced soil erosion combined with improved organic matter in soils, leading to better carbon sequestration, and increased agro-biodiversity. As a result soils are healthier, are better able to hold water and are more stable, can sustain plant growth better and have a higher nutrient content. All this enables farmers to grow crops for longer periods, with higher yields and in marginal conditions. This of course can make a major impact on reducing the food insecurity of a region. Animals are an important component of an organic farm. They form part of a system in which all parts interact to their mutual benefit. But opposed to the crops, animals are also living creatures, sentient beings with feelings. This aspect of the animals requires special considerations and makes their management fundamentally different from that of crops: "When a farmer is learning to manage a farm with no chemical inputs, sometimes a field may become overgrown with weeds, for example. The farmer might not be able to do much about it, and may simply accept the loss as an inevitable part of learning how to farm organically. However, it is not acceptable to let animals suffer or die." (Vaarst et al., 2004). Animal welfare can be defined and understood in different ways. As explained above, as a minimum, it can be understood as a state in which animals are free of disease, pain, suffering, discomfort and that they should be free to behave naturally in their environment. Organic agriculture leads to improvements in social capital, including more and stronger social organizations at local level, new rules and norms for managing collective natural resources and better connectedness to external policy institutions. Results from the cases in this study revealed that 93 per cent of those involved cited improvements to social capital as integral to their success. 3 Ostrom, 1990; Pretty, 2003. The formation of farmers' groups and cooperatives and less formal community collaboration has lowered the costs of working, led to increased knowledge transfer amongst farmers, reduced the costs of organic certification and contributed to greater food security. Strong networks and links with partners from government, non-governmental organizations (NGOs) and organic support organizations such as the Kenya Organic Agriculture Network (KOAN), the National Organic Agricultural Movement of Uganda (NOGAMU), the Tanzania Organic Agriculture Movement (TOAM), and the Export Promotion of Organic Products from Africa (EPOPA) programme are helping farmers to organize for organic certification, access export and domestic organic markets and gain greater knowledge of sustainable organic techniques, crops and markets. Organic farming leads to an increase in human capital, evident in all of the case studies detailed in this report. All have some element of education that increases the knowledge of organic farming methods and the skills of farmers. In many cases there have been direct improvements in the health of individuals and communities as a result of increased knowledge, an increase in food yields and improved access to food. The ability of farmers to use their better understanding of the holistic nature of organic farming to adapt and change their farming systems when faced with new challenges has resulted in these agricultural systems becoming more resilient to environmental and external stresses. Organic farming can also lead to improvements in the infrastructure (communications and transport) through the need to access markets. Access to markets is an essential part of organic farming, (particularly crucial for export) and farmers, NGOs and governments can work together in order to help farmers to earn premium prices for their organic produce. Of the case studies examined, 40 per cent reported improvements in the physical infrastructure and in market access. Access to markets has increased not only for farmers selling their surplus in domestic markets, but also for farmers selling their certified organic produce in international markets. Poverty is a major contributory factor to food insecurity, and organic farming has a positive impact on poverty in a variety of ways. A recent study concluded that certified organic farms involved in production for export were significantly more profitable than those involved in conventional production (in terms of net farm income earnings). The majority of cases examined in this study reported improvements to the financial capital base as one of their successes. Of these cases, 87 per cent showed increases in farmer and household incomes as a result of becoming organic, which contributed to reducing poverty levels and to increasing regional food security. These conclusions are confirmed by the findings and recommendations of the recently released report of the International Assessment of Agricultural Knowledge, Science and Technology for Development (IAASTD) panel, an intergovernmental process, supported by over 400 experts under the co-sponsorship of the FAO, GEF, UNDP, UNEP, UNESCO, the World Bank and WHO (issued on 14 April 2008) stated strongly that 'the way the world grows its food will have to change radically to better serve the poor and hungry if the world is to cope with growing population and climate change while avoiding social breakdown and environmental collapse. Garrity, D., Okono, A., Grayson, M. and Parrott, S. (eds) (2006). World Agroforestry into the Future. World Agroforestry Centre. Gibbon P and Bolwig S. 2007. The economics of certified organic farming in tropical Africa: A preliminary analysis. SIDA DIIS Working Paper no 2007/3, Subseries on Standards and Agro-Food-Exports (SAFE) No. 7. Njoroge, J.W. and Manu, C. (Eds)(1999). Organic Farming. A textbook for Post-Secondary Education. Published by Kenya Institute of Organic Farming (KIOF). ISBN 9966-9977-1-7. Oestergaard, Troels V. (Ed.) (1991). Oekelogisk Landbrug - en Haandbog (Organic farming - a handbook) . G.E.C Gads forlag, Denmark 1991. Pretty J, Noble A D, Bossio D, Dixon J, Hine R E, Penning de Vries F W T and Morison J I L. 2005. 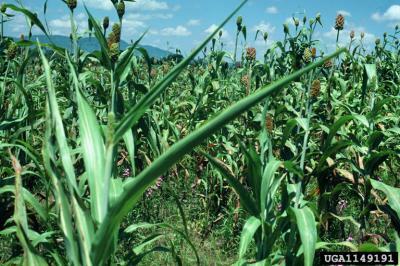 Resource-conserving agriculture increases yields in developing countries. Environmental Science & Technology 40(4), 1114-1119. Schroth, G. and Sinclair, F.L. (eds) (2003). Trees, Crops and Soil Fertility, Concepts and Research Methods. CAB International 2003. Wright, Simon; McCrea, Diane (Eds) (2000). Handbook of Organic Food Processing & Production, Second edition, Chapman Hall UK.